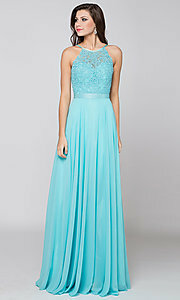 Here's a long prom dress with sparkling accents at price that won't break the bank. A beautiful prom dress from our 2019 collection, this long formal evening gown is well-priced under $200. Richly designed with trendy details, this lovely long dress has delicate embroidery alight with sparkling beading on the sheer-illusion high-neck bodice. A flattering silhouette is yours with the long chiffon skirt that gathers at the natural waistline with a satin waistband then flares out to a fabulously full a-line skirt. Ready to impress at winter formals or prom, this long prom dress is a classic that will never go out of style.